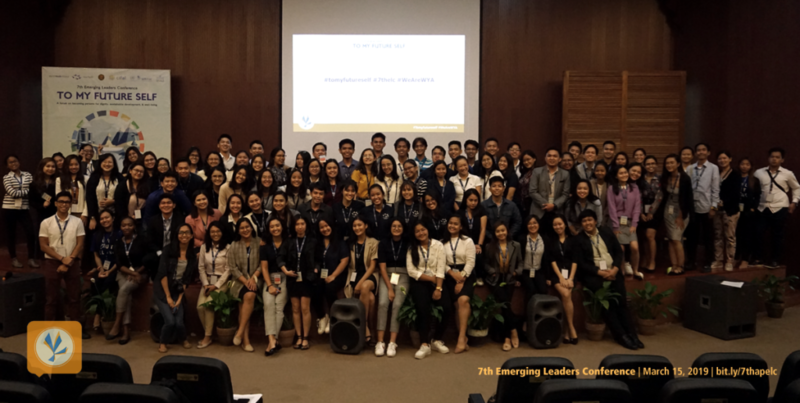 March 15, 2019—World Youth Alliance Asia Pacific (WYAAP) successfully hosted its 7th Emerging Leaders Conference (ELC) on March 15, 2019 at the University of the Philippines Diliman (Quezon City, Philippines). The conference, entitled, “To My Future Self: a forum on becoming persons for dignity, sustainable development, and well-being” was organized in collaboration with the University of the Philippines Centre International de Formation des Autorites et Leaders (UP CIFAL Philippines) and was designed to focus on the theme of dignity, health, and bioethics. The Emerging Leaders Conference (ELC) is a major annual program of the WYAAP where young individuals and industry professionals converse about salient issues of society today and where WYA Members learn more about how to become effective youth leaders who can defend the dignity of every person. Through talks, breakout discussions, and interactive activities, participants of the ELC were given the opportunity to learn from engaging speakers and to build networks and friendships with people from different backgrounds. Grounded on the understanding that every person has inherent dignity, the 7th ELC focused on three core areas: mental and emotional well-being, physical well-being and bioethics, under the umbrella of Sustainable Development and the Sustainable Development Goals (SDGs). The conference was designed to enlighten youth delegates and educators alike about topics related to the theme and to encourage productive discourse and individual reflection on how we could foster individual holistic growth and achieve sustainable development. Dr. Edna Co, Executive Director of the UP CIFAL Philippines, and Mary Imbong, Regional Director of WYAAP, opened the conference, introduced the ELC theme, and welcomed the delegates with their speeches. The 1-day event was attended by 89 youth delegates and educators from high school to university levels as well as young professionals and teachers of various fields. To achieve the conference objectives, WYAAP and UP CIFAL designed a program consisting of talks on Social Media and Psychology, instructed by Karen Rose Vardeleon, RPsy, RPm, CSCOP of Childfam Possibilities Psychosocial Services; Human Dignity and Bioethics, instructed by Cary Amiel Gil Villanueva, MD of Universitas Foundation; Advocating Road Safety and the SDGs, instructed by Vincent Lazatin, host of road safety vlog, Right of Way on Rappler.com; and Promoting Well-being and Joy in the Home, instructed by WYA Alumni and KonMari™️ Consultant-In-Training, Renelyn Tan-Castillejos of Yorokobi. In between and following the lectures were activities designed to encourage interaction among all guests: the Solidarity Dance (a crowd favorite), and breakout group activities where the delegates had the opportunity to present their key takeaways to the whole delegation. The ELC has been implemented since 2012, covering topics related to Sustainable Development, the Millenium Development Goals, the Family, Health and Education, Environment and Technology, and Migration and Development. The next WYAAP ELC for 2019 will focus on the theme of Dignity and Good Governance. WYA operates in six regional offices around the world. The Asia Pacific office is located in Manila, Philippines. Learn more about WYA by sending an email to asiapacific@wya.net or calling +632 9215162. UP CIFAL Philippines is a hub for training, advocacy, and research on the 2030 Agenda for Sustainable Development. Established through the cooperation between the University of the Philippines and UNITAR, UP CIFAL Philippines offers courses that use various learning methodologies designed to “suit the needs of national and local authorities, policymakers, technical officers, development workers. and other stakeholders.” (excerpt is taken from the UP CIFAL Philippines official website). WYAAP extends its gratitude to the UP CIFAL Philippines, all ELC resource partners, event partners, sponsors, donors, WYA Alumni, and volunteers for largely contributing to the implementation of the7th WYAAP ELC. WYAAP also thanks all its conference delegates and educators for their participation, energy, and support to the mission of WYA. View photos and stay updated on upcoming WYAAP events by following the WYAAP Facebook Page, Instagram, and Twitter.